Today being Maundy Thursday in the Christian calendar (the day on which Jesus had his Last Supper with the Apostles before the Crucifixion) prompts me to look back at a television production of a play which was transmitted on a Maundy Thursday over fifty years ago. When I was recently doing some data entry for the Screen Plays database the production caught my eye because it was staged in the unusual location of the nave of Bristol Cathedral. What a technically challenging location this may have been for the performance of a play for television transmission, with its potential complexities with regard to space, lighting and sound. The play in question is The True Mistery of the Passion, James Kirkup’s translation and adaptation of the 15th-century French mystery play Mystère de la Passion by the brothers Gréban (that is, Arnoul Gréban with the assistance of his brother Simon). This is one of the most famous French mystery plays, the measure of its success being the number of manuscripts that survive to this day and the number of later authors who – in the tradition of continual adaptation in mystery plays – drew on it in their own work. Its 35,000 or so lines were designed to be delivered over four days of performance: the first day’s drama covers the Creation, the Annunciation and Jesus amongst the Doctors; the second day moves from coming of John the Baptist to Peter’s Denials; day 3 includes the events from the Passion to the Entombment; and day 4 covers the Resurrection and the Appearances. The English version of Mystère de la Passion was made by poet and translator James Kirkup whose reading of the French original on a long train journey inspired him to adapt it to English. His text was reviewed favourably by Mary Crozier in The Guardian: she considered that it ‘had the plain, simple dialogue and rhyming couplets which are far more striking, more down-to-earth and full of meaning than any sonorous and poetical writing on this theme’ (16 April 1960, p. 3). The True Mistery of the Passion was first performed on radio in a production by Martin Willson and Brandon Acton-Bond, with music specially composed by Reginald Redman (9.15pm, 18 April 1957, Home Service, where it was repeated at 9.15pm on 3 April 1958). We began thinking of a television production of the play when we were planning it for radio. We were borrowing then from certain television methods to help us solve some new problems in that presentation. However, there still remained many problems to be overcome for television; technically, because of the extreme difficulty of mounting a television drama in a cathedral, in sound coverage, in lighting such a great area, in the building of the three stages, and in the installation of six cameras and their ancillary equipment; artistically, because we intend to present the play as a medieval performance, and the right balance between the unpolished acting on the platforms, which serve as stages, and the demands of the television camera for reality must be satisfying. (Radio Times, 8 April 1960, p. 15). The aim, in other words, was to re-create a medieval performance in its entirety, including the audience, and presenting an action on three levels – that of the village community, that of amateur acting, and that of the Passion itself. One advantage of this approach is obvious. By providing a realist basis the adaptor has made it easy for a modern audience to accept the unrelated idioms – knockabout comedy, Grand Guignol, and austere poetry – that are jumbled together in the old text. Less obvious is the opportunity it gives for interaction between illusion and reality, a chance which the production seized magnificently – the casual atmosphere of a charade gradually contracting into tragic intensity that united the actors and the spectators. Immediately before the crucifixion, the carpenter turned to his companion, his voice shaking with anguish: ‘They’ll be hammering in the nails in a minute – terrible noise that makes’; and when the vast cross was raised into position it broke through the fourth wall, transforming the audience into witnesses at Calvary. I have often felt that television can, in religious programmes, approach more nearly to the medieval style where plays and moralities were acted directly to the people. In this programme, which was staged in the nave of Bristol Cathedral, this is exactly what happened, and the BBC showed a bold and intelligent grasp of how it should be done. […] The cathedral setting was used with freedom and imagination by the designer and producer […]. The crowd of onlookers was part of the scene, following the action from one scene to another, and making their comments, so that the viewer was included among them. What is striking in both of these reviews is the common sense of how the production managed to make the viewer at home feel part of the drama’s internal ‘audience’ of medieval villagers. 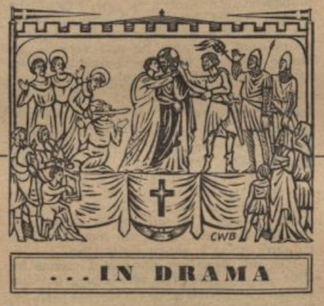 The cross ‘broke through the fourth wall, transforming the audience [at home] into witnesses at Calvary’ and the domestic viewer ‘was included among’ the ‘crowd of onlookers’ in the drama. I am keenly interested to find out more about this production and how it achieved this effect. To round off, it is worth noting that Crozier considered that Charles Houston’s acting in the role of The Man Who Plays Jesus was ‘quiet, delicate, and rather formal’ whereas Ewen Solon’s Pilate was ‘brisk, military’. The recorded production received a repeat transmission at Easter the following year (2.45pm, 31 March 1961) and Kirkup’s entire translation was published by Oxford University Press in 1962. This brought back memories. I saw the 1961 repeat: what sticks in my mind was what one of the critics you quote described as the formal atmosphere of the opening procession being broken up by the individual citizens being chosen for, and assuming, their roles. I recall the earthy, natural authority that George Woodbridge brought to that scene. I have a memory of what appeared to be quite an epic drama, with a large (and very distinguished) cast condensed into a small screen. But the actor playing Jesus did seem, to my very immature eye, a bit insipid, which I think reduced the emotional impact of Calvary. There seems to have been an enormous amount of religious drama at that time: Joy Harington’s version of “Jesus of Nazareth” in the early 1950s – I recall a children’s serial of the life of St Paul as well around that time and a production of Andre Obey’s play, “Noah”, with Leo McKern. 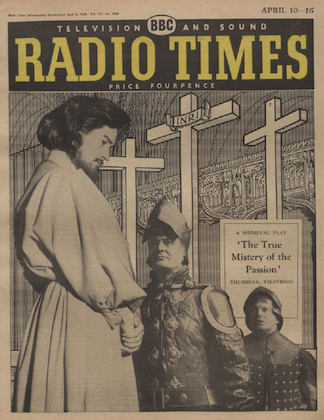 Perhaps some of this stemmed from the devotional dramas that Dorothy L Sayers had written for the BBC during and after the war (“The Man Born to be King”) etc, some of which, think, were still being revived on radio in the 1960s? It would be interesting to know more about this strain of broadcast drama. Keep up the fascinating work! I really appreciated your memories of the 1961 repeat of this production, David – thank you. Yes, indeed, this seems to be my impression from walking through the Radio Times, day-by-day over this period: there was an awful lot of religious (by which, in this time and place, meant Christian) drama and especially concerned with the big dates in the Christian calendar. I could (and perhaps should) have written more about the context of the other dramatic programmes on television this particular Easter. I do intend to write more about the mystery plays on television so do please keep reading! Thank you Amanda. It is only now that I understand the enormous challenges that faced my father Brandon in those early days in BBC television, as indeed he also faced with some of his early radio work. It brings back memories too, as he recruited me as a 16 year old member of the mediaeval crowd. Somewhere I have a couple of still shots. No, it was not nepotism, I was not paid and had to hang around the cathedral for hours and hours on, I think, different days. I think I watched the repeat. The pressures of live drama direction on television were immense, and it remains a tragedy that so much of this early work is now lost, and even when recorded as this must have been for the repeat, those recordings were later destroyed. George Woodbridge often acted in plays my father directed. He was always kind to me. My father was not remotely religious, but liked and respected Martin Wilson hugely, and enjoyed working with him. Thank you very much for writing, and I’m pleased this piece was interesting to you. Your personal recollections are really valuable to hear! I’ve written this blog essay up to appear as part of a longer journal article for Shakespeare Bulletin, volume 33 issue 4 and I’d be delighted to share that with you.